Hello lovelies! 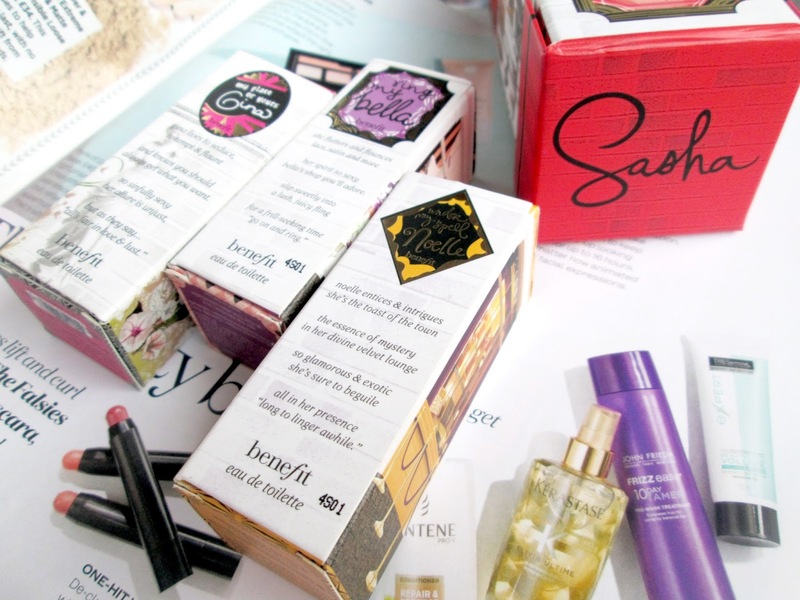 Some readers may remember that a while ago I decided to treat myself and splurge out on some miniature Benefit perfumes, which I absolutely adore. I reviewed them here at the time, but after my blog was re-invented I reverted the post back to a draft. As it so happens, the other day I managed to score myself a full sized perfume for only £15 in the January sales, so I thought I would do a full review here of all the Benefit perfumes that I currently own. I absolutely adore perfume and hardly ever leave the house without any on, even if I'm not wearing any makeup (which is rare, I will admit) so having lots to choose from and vary throughout the seasons is a must for me. Each Benefit perfume costs £29.50 for 30ml and can be purchased online or from your local benefit selection in Boots, however I got my beautiful miniatures all for £20 brand new. I would definitely recommend buying the miniatures first in order to test before you invest, and you'll be amazed at how much 10ml really is. I have tried each of the perfumes for 24 hours at a time over several weeks, in order to make it a fair test. I was planning on re-selling 'Gina' and 'Noelle', but I think I might have changed my mind now. Due to them being absolutely lovely! The first perfume up for review is the gorgeous Ring My Bella. I decided that I simply must get my hands on 'Bella' about 3 years ago, when a friend of mine brought her bottle to school and gave me a good spritz of it! My first opinion of this perfume was that it smelt very flowery and delicate, slightly similar to talcum powder! This must have been the rose, which is definitely the most powerful aspect of the scent, but don't let that put you off as the perfume soon mellows into a beautiful vanilla scent. I am absolutely addicted to it and it is easily my favourite of the three miniatures. I can very easily imagine beautiful Bella flouncing around sweetly in her lacy lingerie! This perfume makes me think of 1950's pin-up girls, its a very delicate, vintage scent. The perfume is quite strong and even lasted overnight; I did not have to re-apply it at all during the day, and I got some lovely compliments from my mum about how nice it smelled when she hugged me (I had dabbed some behind my ear.) The two 10ml bottles will last me absolutely ages as it is such a lasting scent. At first I found this perfume to be very strong and synthetic smelling, a lot like many high-street perfumes, however the longer I wore it, the pleasanter it became. With a very strong scent of patchouli, I couldn't detect any hint of tangerine as there should be. I wouldn't call this a seductive perfume, but it is definitely very playful with the hints of pink pepper which appear the longer the perfume is worn. It becomes a very sweet perfume, suitable for a cuddly evening in watching movies with friends. It is also a fruity perfume which isn't as sophisticated as the other two, but is still special in its own way! I love how happy it makes me feel when I wear it, and I think I'm likely to wear it more often than the other two, despite only having one bottle. It lasted faintly almost all day and I only found myself re-applying it once, but I can see myself using up quickly as it's just so lovely and sparks lots of happy memories! Overall: A fruity, fun, delightful, cuddly, happy perfume suitable for a night in with the girls! I will admit, my first impression of this perfume was 'my nan would love this...' as what I assume was the jasmine was initially very strong. However after about 5 minutes, I notice it become much more citrus-y and very sweet. It's a very sultry, oriental perfume which does remind me a little of joss sticks, however it is not over powering. It is also quite a unique scent in the sense that it is both warm, and fresh. Spicy, yet the raspberry gives it a beautiful juicy tang. I really enjoyed wearing it all day, however I would say it's more of an evening perfume, definitely suited for a velvet lounge as mentioned in Noelle's poem! After half an hour, the jasmine scent had completely vanished, leaving a woody and exotic scent behind. It's not very strong unless you press your nose to your wrist, and I had to apply it probably twice throughout the day as I thought it had started to 'disappear' a little. I doubt this bottle will last me as long as the others, but luckily I have two. Overall: A warm, spicy, woody, exotic, oriental evening perfume that is very addictive. Sasha is the only Benefit perfume I own which is full sized and it was definitely a good choice! I first came across this perfume on a shopping spree in Doncaster - I got chatting to the girl at the Benefit counter and she recommended it for me. It is so different to all of the other perfumes, but I feel I like it the most out of them all. Sasha is a very subtle white floral scent which I find myself reaching for way more often than the others. It is very light, no where near as flowery as Bella or as oriental as Gina or Noelle. It is fruity, with the orange blossom being the most apparent note. It's a really happy, girly scent which makes it my favourite as I feel it can be worn for lots of occasions throughout the year. Overall: A very fun, subtle, happy scent with fruity and playful notes that remind me of summer days. Which perfume sounds like it would be your favourite? Do you own any Benefit perfumes?